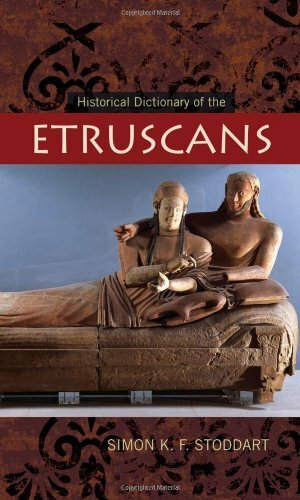 [PDF] Historical Dictionary of the Etruscans (Historical Dictionaries of Ancient Civilizations and Historical Eras) | Free eBooks Download - EBOOKEE! Description: The Etruscans were the creators of one of the most highly developed cultures of the pre-Roman Era. Having, at one time, control over a significant part of the Mediterranean, the Etruscans laid the foundation of the city of Rome. They had their own language, which has never been totally decoded, and their art influenced such artists as Michelangelo. While the Etruscans were eventually conquered by the Romans, they left a rich culture behind. The Historical Dictionary of the Etruscans relates the history of this culture, focusing on aspects of their material culture and art history. A chronology, introductory essay, bibliography, appendix of museums and research institutes, and hundreds of cross-referenced dictionary entries on important persons, places, events, and institutions provide an entry into a comparative study of the Etruscans. No comments for "[PDF] Historical Dictionary of the Etruscans (Historical Dictionaries of Ancient Civilizations and Historical Eras)".